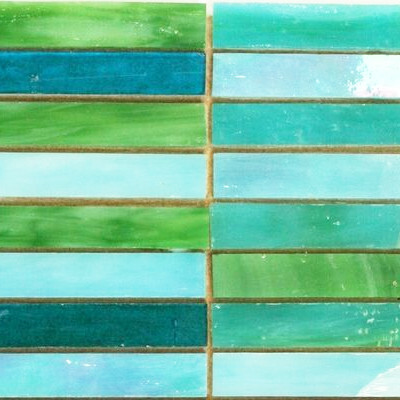 Perfect hand cut slim strips of Tiffany stained glass ready to be easily nipped into tiny tiles for your next mosaic project. Each sheet contains a vibrant mix of coordinated colors for wide ranging projects or can be directly used for installation. These tiles save a tremendous amount of effort and expense by reducing preparation and wastage. All colors and finishes and permanent and UVA and frost resistant. Each tile is 1/3 inch (10mm) wide, 4 inches (100mm) long and 1/6 inch (3mm) thick. 1 sheet = 150 tiles and 1 square foot.